These cryptic words, uttered by Metatron as Dean Winchester tortures him, are meant as a clue to where the cure for the Mark of Cain will be found, but to me they also symbolize what has been happening on Supernatural these last few seasons. I think it has been an unspooling of sorts. A slow (sometimes VERY slow) undoing of some of the dense layers of wishful thinking, guilt, mistrust and misunderstanding that surround the Winchester brothers and some of the other characters in their universe. As the veils lift and the brothers finally begin to see each other more clearly and not through the layers of guilt and feelings of inadequacy, they are taking a journey back to the beginning in a way; back to being brothers and heroes. In season 8, both Sam and Dean each entered a purgatory of sorts. They lived a stylized dreamlike version of what they thought they were looking for all along. Sam got his white picket fence life, and Dean got the pure hunt. Of course; that domestic life still was rife with pain, and even had people coming back from the dead. And the everlasting hunt of Purgatory for Dean was really a corrupting war, with its own victims and PTSD. Season 8 also saw Sam almost sacrificing himself for the chance to be rid of the stain of demon blood that he carried around for so many years; confessing to feeling that his brother deemed him inadequate. Last season Dean came face to face with the demon within after being faced with his biggest fear; the loss of his brother and the resulting lack of purpose in his life. We pick up the story after the winter hiatus, right where we left off. Dean is still reeling from losing control to the Mark of Cain and killing a room full of humans and Sam and Cas have no clue how to help him. Apparently the Mark predates lore and creation, so the idea is hatched that perhaps the scribe of god, who would have been present at the time, would have some ideas about how to get rid of the ancient tattoo. Castiel procures the help from another angel to “borrow” Metatron (an effectively menacing Curtis Armstrong) from his heavenly cell for some interrogating, with a promise to let no harm come to him. Cas has been on his own journey. He is learning how to be an angel again. He is back to his original mission; to protect humankind. But as Hannah reminded him; these human lives and emotions are not theirs and only borrowed. In his interference on earth, Cas has done some awful things. Some of which he has yet to face. In trying to take responsibility for Claire (Kathryn Newton), his erstwhile human vessel Jimmy Novak’s wayward daughter, Cas is looking for some redemption. Unfortunately Claire won’t have any of it. She can only see more heartache, especially since she experienced yet another loss, this time at the hands of Dean Winchester. It seems ludicrous that Claire would mourn Randy, the man who basically sold her to a loan shark to save his own skin, but that just goes to show you how her life had been broken as a direct result of Castiel’s actions and her father’s choice all those years ago. Claire ditches Cas and hooks up with some drifters who promise revenge on her behalf. Metatron tells Sam and Dean that he does have a way to erase the Mark, but besides revealing that they will need the First Blade, he refuses to give any more clues until he gets some things in return. Dean sneaks off to confront him alone and it is clear that Metatron is already getting exactly what he wants; an out of control Dean, who, as he gets more and more frustrated, gives into the violence. Metatron taunts Dean with a laundry list of his sins as Dean sinks deeper into darkness. When Cas finally breaks down the dungeon’s door and runs to free Metatron, it is once again Sam’s voice that reaches Dean and brings him back from the edge. A frustrated Cas whisks Metatron away and Dean sinks back into despair. In a great scene that really illustrates what a mirror image this situation is for the brothers, Sam tells Dean that they will figure this out together and that perhaps the powerful force needed to eliminate the Mark of Cain lies within Dean himself. Dean Winchester has plenty of darkness in him with or without a curse but as long as he has his brother to believe in him, he can overcome anything. I think that is the lesson in all of it; through all the affairs with angry vets and reformed vampires, through all the trials and tribulations; what these brothers need the most is each other. As a good friend of mine says; they keep each other not just human, they keep each other Sam and Dean. As they have gained understanding, they can see each other more clearly and therefore themselves too. It is refreshing and welcome to see Sam be there for Dean without condition and for Dean to defer to Sam and accept his help without reservation. 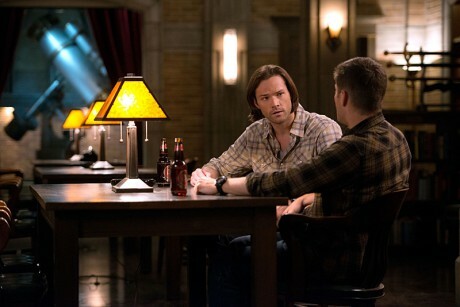 Even though it’s against Sam’s better judgment, the boys contact Crowley to retrieve the First Blade. Crowley seems eager to get out of his dingy lair and meets up with the boys. Of course Crowley has his own problems. His long lost mother Rowena (Ruth Connell) is hexing and scheming her way into his inner circle and she uses the Winchesters and the First Blade to convince her son that she is the only one for him to trust. I found much to like in this episode, written by Eugenie Ross-Leming and Brad Bruckner and beautifully directed by John Badham. It is perhaps no secret that I often find the writers of this week’s script problematic. They can make cringe worthy choices and play fast and loose with long established canon. Any story and plot problems this week however, were more related to the overall pacing of the season so far and most of all to the current structure of maintaining a B (Cas) and C (Crowley) storyline alongside the brothers’ main A plot. In my opinion it is detrimental to all three. There are so many questions about the secondary plots that are not being answered. Why is heaven still not open? Why is Cas still driving? What is Crowley doing on earth? What is the purpose of these storylines at all? They are seemingly not connected to the Winchesters, yet strangely both Crowley and Cas appear only in the mytharc episodes, with the MOTW ones being reserved for Sam and Dean and various guest stars. The Claire storyline could have been an interesting one for Cas, but it is not at all related to Sam and Dean, or Crowley for that matter. And I love Rowena as played by Ruth Connell, but what does she have to do with either Cas and/or the Winchesters? Jumping back and forth between the separate storylines is not only jarring in the narrative, but also stylistically. The end scene with Cas and Claire at the side of the road stands in such tonal contrast with the scene chewing, hilarious but bordering on cartoonish Rowena, that it feels like I’m not in the same show anymore. I have other quibbles. I understand that we needed to see Dean alone with Claire and her new buds, so we could see him take control of his aggression, even though he was being attacked, but do we really believe for an instant that Sam Winchester would let Dean go out there alone to meet up with an angry teenager, right after that near fatal violent outburst? Once again, character is sacrificed for plot. I also found it offensive that we were supposed to feel sweetly sentimental about the moment where a powerful being who did something very harmful, leaves the young victim of that violence alone at the side of a country road, gazing wistfully at her in his rear view mirror. That is not only the height of irresponsibility, it is unearned redemption, and it once again diminishes the complicated character of Castiel. I also find it pretty criminal to waste the fantastic, new series regular Mark Sheppard on such a third tier storyline. So far he has been sitting on a throne and is being much too easily manipulated by a more than transparent Rowena. I need me some smart, devious Crowley and something real for him to do. There is so much that is great this season, but structurally there is much that needs to be reexamined. I am enjoying the Winchesters and their newfound connection, but the full focus needs to go back to them, or the side plots need to be better integrated into the overall arc. With the welcome news of an early season 11 renewal from the CW, here’s hoping that Supernatural keeps building on its strengths and is brave enough to once and for all leave behind its weaknesses. Give us your thoughts on the second half of season 10 and what’s ahead for season 11 below. We always love to hear from you.